Due to the fact that titanium bicycle is one of the most widespread titanium application in the sports field, one can hardly summarize everything there is to say about it in just a webpage. This would be no more than an introduction, an attempt to give you a general idea about what you would expect when assessing a titanium bike. To start, I can tell you that titanium bicycle may be one of the reasons that many people think that Eddie Merckx was one of the greatest cycling champions of all times. He was the first sportsman that used one in a major cycling competition – the 1972 edition of Tour de France, which he won. Of course, I’m joking. The true performance in the sport field can be achieved only by these great few athletes that have both the physical abilities and the real desire of success that can make the difference between average and breaking the world record. Not even a god metal like titanium can overpass this. Initial attempts of creating titanium bicycles were made with the objective of achieving diminished weight in titanium bicycle frames. 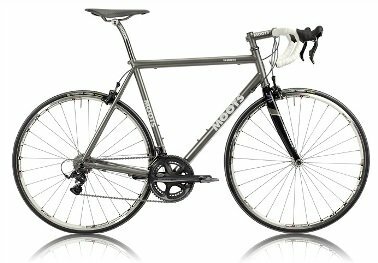 Titanium, with its unsurpassed strength to weigh ratio, seemed to be the perfect material, as the efficiency of the cycling experience is strongly influenced by the weight of the bike, especially in titanium mountain bikes which are heavily influenced by lightness for achieving best performances. Other titanium properties, such as corrosion resistance and fracture toughness were additional benefits which weight heavily on manufactures decision to use this metal in making bicycles. There were also some unexpected side effects that were discovered when the first titanium bicycles reached the consumer market. One of them was that titanium bicycles that were designed with an emphasis on diminishing weight were more flexible than what a common rider usually expected and as such offered a somewhat peculiar experience when maneuvering, though this provided a beneficial side effect in building titanium seatposts. This type of feedback was strong enough that producers began searching for solutions that would alleviate this issue even if this would mean adding a few extra pounds. To bring the stiffness more into line with what riders like the manufacturers use somewhat larger diameter tubes, especially in a titanium road bike. This tends to increase the weight a bit, but by making the walls of the larger tubes a bit thinner, this can be compensated to some extent, with the final result being a frame that is still lighter than a normal steel frame. All titanium bikes are known for their spectacular long – life, and all the producers agree that most of them can outlive their initial purchaser. This is due to superior titanium elongation properties. Titanium stretched into tubes will wear twice as less than the same amount of steel and up to five times than the same amount of aluminum, these being titanium primary competitors in bike industry. Titanium has a reputation for being difficult to work with, though perhaps it is more accurate to say that it is more particular than other metals and requires meticulous procedures, making it time-consuming and labor-intensive. The only weak points of a titanium frame are the joints and welding spots. Welding titanium is a task that can make many a professional reach its limits and this must be your first quality check when evaluating a titanium bike. As compared to aluminum, steel and carbon fiber a titanium bicycle exhibits some strong and weak points, depending on the particular bike they are used for. It is true that carbon fiber frames can be manufactured lighter, without suffering the flexibility penalty that titanium bicycle frame show when the girth of the tubes is diminished, but that doesn't necessarily make for a better choice. In rocky or accidented areas, where a light mountain bike is usually put to hard use, the roads and the rocks really chip the heck of any painted or clear coated frames, so in a very short period of riding a carbon bicycle frame looks like it was inherited form your grandfather. Titanium positions itself in a very comfortable spot between steel and aluminum as regarding to shock absorbing capabilities and returning the energy of the road impact. It’s true that tires volume and the fork have a say in this, but the main factor is the bicycle frame. Steel is stiffer than titanium and returns almost all of the energy of road impact, but does a poor job at absorbing this shock, making longer rides a bit uneasy. While aluminum is more flexible, making for a more comfortable ride, in the long run, the reusing of the energy that road impact provides can really make a difference. Experienced bikers agree that titanium well optimizes these sensible parameters, and for all those who are willing to pay the price (pretty high), a titanium bicycle can become a truly deadly weapon in the right feet.